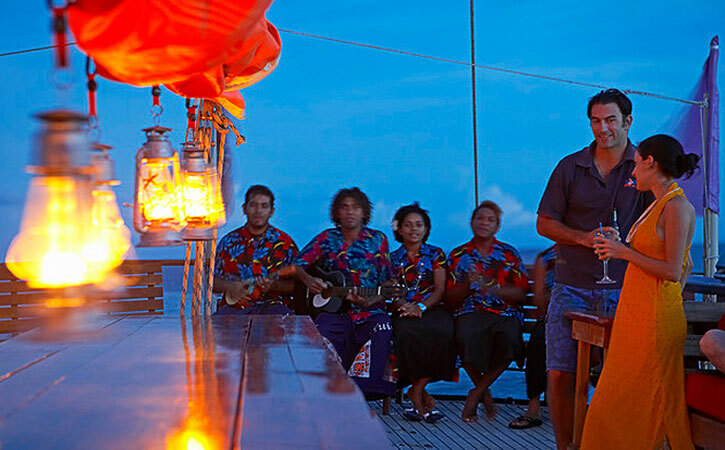 Called the “world’s sexiest cruise ship” by Conde Nast, Tui Tai is one of the premier liveaboard cruises of Fiji. Experience the trip of a lifetime on the A/S Tui Tai, a magnificent 140 foot sailing schooner based on the island of Vanua Levu in Savu Savu. She is equipped with Perception kayaks, Kona mountain bikes, Scubapro dive and snorkeling gear and air-conditioned luxury accommodations in 12 cabins for 24 guests. Visit remote beaches, dive incredible reefs, kayak to local villages, and experience the most breathtaking locations across Northern Fiji. One Available (300 sq. ft / 28 sq. mt – Private Rooftop Cabana 200 sq. ft / 19 sq. mt). Larger than the Grand Stateroom (described below), this spacious cabin has its own enclosed veranda with stunning direct-to-ocean views. Enjoy a private entry far from other cabins, private bathroom with shower and pebble floors, air conditioning, oversized luxury towels of 100% two-ply Turkish Cotton, and a queen-size bed with 1000-count Egyptian Cotton sheets .Personal entertainment systems with plasma style LCD/TV, DVD/CD player, and an iPod docking station. One Available (205 sq. ft / 19 sq. mt – Private Rooftop Cabana 120 sq. ft / 11 sq. mt). Larger than the Stateroom (described below), this spacious cabin has its own enclosed veranda with stunning direct-to-ocean views. Enjoy a private entry far from other cabins, private bathroom with shower and pebble floors, air conditioning, oversized luxury towels of 100% two-ply Turkish Cotton, and a queen-size bed with 1000-count Egyptian Cotton sheets. Personal entertainment systems with plasma style LCD/TV, DVD/CD player, iPod docking station. One Available (each 164 sq. ft / 15.2 sq. mt). Relax in Tui Tai Cruise's most spacious and luxurious stateroom, with its own sitting area and doors that open out onto the bridge deck and the sea beyond. The Grand Stateroom offers complete privacy with its own bathrooms, air conditioning, and queen-size beds. Large windows and floor to ceiling glass windows offer exquisite views. The Grand Stateroom features a personal entertainment system: plasma style LCD/TV, DVD/CD player, and iPod docking station. One Available (each 114 sq. ft / 10.6 sq. am). Smaller than the Grand Staterooms, yet offering the same luxury features: complete privacy, private bathrooms, air conditioning, and queen-size beds. Floor to ceiling glass windows offer premium views. Staterooms feature a personal entertainment system: plasma style LCD/TV, DVD/CD player, and iPod docking station. Eight Available (each 96 sq. ft / 8.9 sq. mt). Each Expedition Cabin offers a double bed that sleeps two, adjustable air-conditioning, and private bathrooms ensuite. Expedition Cabins also have a Pullman bunk for twin sharing or a third guest. Observation windows offer views of the sea. Permanent staff includes Dive Instuctors who are experienced underwater photographers; able to handle all types of camera/housing/gear. Kokoda Point is one of Fiji's best wall dives. Crystal clear visibility and a dramatic dropoff make for a prime spot to meet pelagics: barracuda, tuna, eagle rays, sharks and more. The wall is decorated in soft corals, crinoids and large fans.One patch of the wall is covered in sea grapes, for which the site has earned its name. The wall is teaming with fish life and macro creatures. The wall just off the reef wall took a couple tries to find, but it was worth the search. Pinnacles emerge from the depths, covered in soft corals and clouded by orange and purple anthias. This has been a great site for nudibranchs, flatworms and lionfish. One of our favorite Rainbow Reef dives in Somosomo Straits.Two bommies are wrapped by fresh currents from the Strait provided a staggering cover of lush soft-corals (purple, yellow, white, red and more).Swarms of anthias and small fish will be all around you as you drift along. White-tip reef sharks cruise along and often sleep near the edge on the sea floor. Several large camouflage groupers and maori wrasses make their homes here. Dive Site: "The Great White Wall"
Renowned as one of Fiji’s top dive sites. Prepare to be awestruck by a steep wall that descends endlessly to the bottom, completely smothered in lush white soft coral. Off the deep edge of the wall you will find some pelagics. Often schools of batfish stop by to greet us while we drift along the wall. At the end of the dive is a deep swim-through cavern providing an exciting exit to an amazing dive.